Electro Harmonix 22500 loop station review– based on Question/Answer format so you can skip around to what you care about. Competitive Position: The EHX 22500 competes head to head with the other dual-loop loop stations like the Vox Dynamic or Lil Loopers and the Pigtronix Infinity. It also competes with other loopers that can accomplish the verse-chorus switching like the EHX 45000, the Boomerang III or the Boss RC-300. One word of caution, this pedal has a lot of features and is complicated to use. Also, several operations are not enabled via footswitch (like erasing a loop). What is the price I should expect to pay for the Electro Harmonix 22500 and how does that compare to other loopers? Please see our price tracker that we update regularly. Here, the various looper stations are categorized and the price is tracked over time as indicated. What is the main function of the Electro Harmonix 22500? The main function of the 22500 is looping, and it is packed with features for that. Most notably, you can do a verse-chorus-verse song very easily. How many tracks can be played in parallel with the Electro Harmonix 22500? The EHX 22500 loop station two tracks, both with independent volume and reverse/octave control. 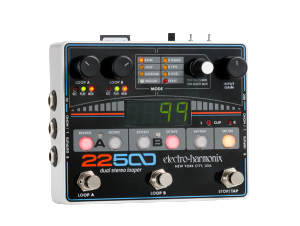 How many memory locations (slots) are included in the Electro Harmonix 22500? The EHX 22500 has 100 memory slots. How long can I record with the Electro Harmonix 22500? The 22500 can record 6 hours of play time on the 4GB SDHC card that comes with the unit. If you buy a separate 32GB card, you can record up to 48 hours. Most reviews would tell you that is a ridiculous amount of recording time and you would never use it. I’m going to start making this point as much as possible – you could use it. A lot of people use a looper as a quick capture device for song ideas. I remember filling up many SD cards full of short song ideas as this is the fastest way to build up a complex idea in a very short amount of time. Can I record sound, continuously play a loop of that recording, and then layer additional tracks over the loop/phrase with the Electro Harmonix 22500? Yes, the 22500 has basic looper functionality with unlimited overdub. Simply press one of the Loop buttons (they recommend you start with Loop A) and it will start recording. Press the button again and the recording will continue to loop. You can then add layers to that sound. This used to be called “sound on sound” a long time ago. Now it’s called looping. Using the Electro Harmonix 22500, can I learn by having an instrument teacher play something and then slow it down and work on matching the notes and gradually speeding up? Yes, the 22500 has tempo control via the primary selector knob (white), where you can slow down or speed up the music and it’s an excellent way to learn. This isn’t as easy to control as other loopers, and definitely not hands-free. But at least it has tempo control. Can I practice soloing with the Electro Harmonix 22500? Yes, you can lay down your own rhythm tracks and then play over the top of them, or you can use one of the 16 pre-loaded rhythm tracks. Or you can load other tracks into one of the 100 memory slots via the USB port or SD card. Can I use the Electro Harmonix 22500 to capture quick song ideas to review later? Yes, that is one of the benefits of a dedicated looper that has memory slots available. Many of the loopers do not have the ability to store the recordings for later use. Can I switch to a different loop/slot/bank while performing with the Electro Harmonix 22500? Yes, you can switch to another memory bank on the 22500, but it will stop the playback. Therefore, it is not very conducive to live performance. It’s easy with the separately-sold foot controller – press Loop Up or Loop Down footswitches to go to another slot. Can I perform loop-to-loop queuing with the Electro Harmonix 22500? No, very strangely, the EHX 22500 does not have this feature. Loop-to-loop queuing is when you are playing a current loop/slot and you switch to the next loop/slot without stopping the current. Then, when the current loop completes a playing cycle it automatically switches to the new loop you have selected. The idea is that you could switch back and forth in a song between memory banks/slots. In the case of the 22500, the playback stops when you switch to another memory bank. Can I switch back to the previous loop while performing with the Electro Harmonix 22500? Yes you can switch to a previously recorded loop, but it doesn’t go smoothly. I would not try to do this in a live performance. With the Electro Harmonix 22500, can I record and play different parts of a song (verse, chorus, bridge) all during a live performance while not using my hands (pedals and footswitches only)? Yes, you can create verse-chorus combinations with the EHX 22500 on the fly and hands-free but there are only two tracks to accomplish this with. Therefore, you cannot create verse-chorus-bridge. This video demonstrates that functionality well at minute 7:52. Can I go from recording directly into overdub with the Electro Harmonix 22500? Yes, you can go directly into overdub with the EHX 22500 by pressing the Loop A or Loop B buttons after you have recorded the phrase. Can I undo/redo the last overdub to change the song or eliminate a recording error with the Electro Harmonix 22500? Yes, the 22500 does have an undo and redo. This is unlike the 45000, so it’s good that they added it. Can erase a memory slot/bank with the footswitch on the Electro Harmonix 22500? No, unlike most loop stations the EHX 22500 does have the ability to erase with the footswitch. You can erase via a knob and it’s a process that has a few steps to it. This isn’t a good thing. I’ve read reviews of people that would not buy the looper for this sole reason. Can I set previous layers to go quieter or fade out while overdubbing new layers with the Electro Harmonix 22500? Yes, the EHX 22500 does have this function in “OVERDUB” mode. This function is called “Decay” by Boomerang, “Recorder Overdub Level” by Line 6, “Loop Aging” by Pigtronix, and “Feedback Decay” by others. It is used to gradually or quickly transition a song without stopping or switching your ongoing loop, and many other artistic purposes. EHX refers to this as Feedback control for a delay effect, and they include it with the 45000 as well. Can I adjust the volume or effects of individual overdubs and/or tracks with the Electro Harmonix 22500? With the EHX 22500, you have a good amount of control on individual tracks and overdubs. You are able to control volume, run in reverse, and change the octave separately for Loop A and Loop B. Can I record individual tracks or overdubs/layers as individual WAV files with the Electro Harmonix 22500 to then work with in a DAW? Yes the EHX 22500 automatically saves the tracks as separate wave files within a folder that is allocated to one of 100 memory slots. You can get them onto your DAW via USB or SD card. Can I use the 1/8” MP3/CD input to play song into the looper and incorporate it into my loop with the Electro Harmonix 22500? The EHX 22500 does not have a 1/8” input meant to work with an auxiliary device. However, you can upload songs via USB or SD card. Can I pre-record tracks, edit them in a DAW, load them into the 22500 as loops and then trigger them with the footswitch when needed? Yes, the 22500 is set up to take WAV files via USB. The loop file format is 44.1kHz, 16-bit stereo. There is a strict file format protocol to follow when uploading audio files. They must be .wav and have both track files present and the TXT file. Copy the tempo file from a memory slot where the loop was established on the looper itself. USERBANK.SET needs to be deleted in a bank folder where you are adding your wav files. Can I trigger a one-shot playback (a.k.a. single phrase) with the Electro Harmonix 22500? In other words, can I set the loop to only play one time when triggered? Yes the EXH 22500 does have one-shot (1-shot) playback. This is unlike the 45000, which doesn’t. Can I play multiple loops simultaneously with the Electro Harmonix 22500, and turn them on and off? For example, play drums on one track, base-line on the other, and guitar on another and bring them in and out of the song? Yes, the EHX 22500 has two independent tracks per loop memory slot that can be individually controlled to create various “parts” to a song. Can I play a loop or overdub in reverse with the Electro Harmonix 22500? Yes, there is a button to allow for reverse on the EHX 22500 for each of the two loops. Does the Electro Harmonix 22500 have stereo sound or just mono? The 22500 has stereo sound. Is there anything in the Electro Harmonix 22500 that reduces the clicking sound that can occur when tapping the footswitch during overdub? I am not aware of any feature on the EHX that could address a clicking sound, which may make droning difficult. Is the Electro Harmonix 22500 a good looper for live performances on stage? No, I believe this looper is too complicated for live performance. There are other loopers that I would recommend for that. Are there multiple stop modes in the Electro Harmonix 22500? No, there are no unique stop modes for the EHX 22500. Can I stutter start with the Electro Harmonix 22500? No, the EHX 22500 does not have stutter start (like the Rang III does). Alternatively, you add those effects to a WAV file within your DAW and then import via SD/SDHC card. Can I resample with the Electro Harmonix 22500? In other words, can I take a loop and modify it by multiplying it, cutting part of it out, adding a different effect to it, etc? We are not aware of any resampling or multiply functionality with the 22500. The Rang III does have this functionality. Many loop stations do not. Can the Electro Harmonix 22500 be set to auto-record when I begin playing? Yes the EHX 22500 does have this feature and they call it “Trigger” mode. 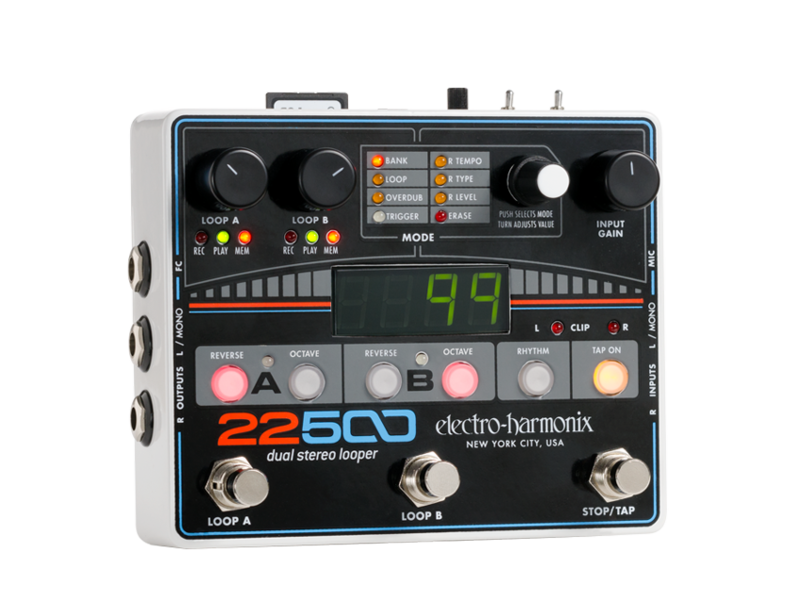 With the Electro Harmonix 22500, are there any issues with droning (playing the same note, chord, repeated sounds, or tone-clusters continuously) at the boundaries of the loops – such as noticeable change in volume? We have not experienced or heard of an issue with droning using the 22500. Does the Electro Harmonix 22500 have a built in metronome? Yes, there is a metronome click with one of the built-in rhythm tracks. Is there any software that comes with the Electro Harmonix 22500? No, there is no specific software that comes with the EHX 22500. Is quantize functionality available on the Electro Harmonix 22500? Yes, you can operate the 22500 in free-form (with no quantize) or auto-quantize mode, where timing errors with loop start and stop are corrected automatically based on the user-defined tempo. Will the Electro Harmonix 22500 interface with my DAW (digital audio workstation)/computer through USB? The 22500 does not function as an audio interface. The USB is only used to transfer the loop files, not stream the audio output to the DAW. Will the Electro Harmonix 22500 interface with my computer through USB to transfer sound files? Yes, the USB port on the 22500 is used to transfer files. Many other loopers on the market do not have this functionality. Can I save and recall loops with SD card with the Electro Harmonix 22500? Yes you can use SD or SDHC cards up to 32GB to save and recall loops on the 22500. Does the Electro Harmonix 22500 have effects (FX)? No the 22500 does not have built-in effects (FX). Can I bypass the effects (FX) with the Electro Harmonix 22500? No, this is not applicable to the 22500 because the unit does not have internal effects. Can I turn off or mute the live signal that is fed through the Electro Harmonix 22500 (for use in parallel effects loops of an amp or in Aux Send/Return of a mixer)? No, there is no way to mute the live signal. On the 45000, they have the ability to adjust the “Dry Out”. They did not add that to the 22500. Can I save presets for effects with the Electro Harmonix 22500? No, this is not applicable to the 22500 because the unit does not have internal effects. However, you can save the loop mode and other options for a given memory bank. Does the Electro Harmonix 22500 have an XLR mic input? Does it have phantom power for a condenser microphone? Yes, the EHX 22500 has an XLR mic input and phantom power for condenser mics. Does the Electro Harmonix 22500 function as a mixer with multiple inputs? The EHX 22500 kind of operates as a mixer because you have two inputs and two outputs. It does not mix those together, but it does record both signals for looping. Can I re-assign footswitch functionality with the Electro Harmonix 22500? No, we are not aware of any way to re-assign footswitch functionality with EHX 22500. Does the Electro Harmonix 22500 have a headphone jack for playback and monitoring? No the 22500 does not have a dedicated 1/4” jack for headphones. Can the Electro Harmonix 22500 be connected to an external MIDI device? No the EHX 22500 does not have MIDI control. The EHX 45000 does. Does Electro Harmonix release firmware updates for the 22500? We are not aware of EHX pushing out any firmware updates to the customer base. Is there an optional footswitch that I can add to the Electro Harmonix 22500 to increase functionality? Yes, there is a footswitch that you can add to change the memory slot/bank for the 22500. Although, I find it somewhat not useful because you cannot utilize that function in a song – so there is not a good reason to make it hands-free. Is there an optional expressional pedal that I can add to the Electro Harmonix 22500 to control effects(FX)? No, there is not a way to connect an expression pedal to the 22500. For the 22500, the A/D/A conversion is specified as 16-bit, 44.1 kHz. Can the Electro Harmonix 22500 be battery powered? No there are no battery options for the Electro Harmonix 22500. What is the size (physical dimensions) of the Electro Harmonix 22500? It’s footprint is 4 3/4″ x 5 3/4″ x 2 1/2″. Why is using a Electro Harmonix 22500 better than just using computer software? Or why should I use a stompbox looper instead of something that is software based? Latency: PC and Mac based looper set-ups cannot match the latency of the loop pedals. This results in more timing misalignment between layers and can degrade the quality of the performance. Latency describes the delays that occur at each stage as the sound travels – therefore, if there is delay between when you make a sound and when it’s recorded, as well as a delay between when the playback is generated and when you actually hear it, then you get the timing issues. Analog pass through: several of the loop pedals have true analog pass through, so that you can reduce A/D and D/A delays in your signal path. Why is using a Electro Harmonix 22500 better than just using an iPhone or iPad application? There is very limited functionality with the iOS based loopers compared to the Electro Harmonix 22500. However, these apps are quickly improving. With added hardware (microphone, Bluetooth control pedal, etc. ), these setups may start to look attractive. Please see our iOS app setup information. What company makes the 22500 and where are they located? Electro-Harmonix (New Sensor Corp.) and also abbreviated as EHX is based out of Long Island City in New York. They are actually credited with developing the first looper in 1983, called the 16 Second Digital Delay. EHX is a well-known guitar effects pedal producer, founded back in 1968. What other loop stations does Electro Harmonix (EHX) make? EHX released the 2880 Super Multi-Track Looper in 2006, which was a favorite of many soundscape looper artists. The 2880 is now discontinued. Along with the (2-track) 22500, they also offer a 4-track (+mix-down) 45000 and the very small form-factor single-track Nano Looper 360. How is the support from Electro Harmonix on any issues that arise with the unit? The tech support from EHX for the 22500 could be improved. They have some complaints in online reviews. They do have an online forum set up, that is well-attended. However all of the questions are just posted on there for all of the EHX products, so it could be organized better. How long has the Electro Harmonix 22500 been in production? The EHX 22500 was announced in July It supposedly utilizes a lot of the predecessor 2880 framework.